Samuel Brown Wylie was born in Moybarg County Antrim, Ireland, May 21, 1773, son of Adam and Margaret (Brown) Wylie. After graduating from the University of Glasgow in 1797, he began teaching a school in Ballymena, Ireland. Because of his support of the movement for Irish independence, however, he fled to America that same year. After studying theology privately under the direction of the Rev. William Gibson, he was licensed by the Reformed Presbytery in Coldenham, New York, in 1799; the following year he was ordained by a Reformed Presbytery in Ryegate, Vermont, becoming the first “Coventor” clergyman to be ordained in the United States. He traveled with the Rev. James McKinney trying to abolish slaveholding in the South. In Philadelphia, in 1803, he was installed as pastor of the First Reformed Presbyterian Church, serving until his death fifty years later. He also taught at the newly organized Theological Seminary of Philadelphia from 1810 until 1817. Rev. 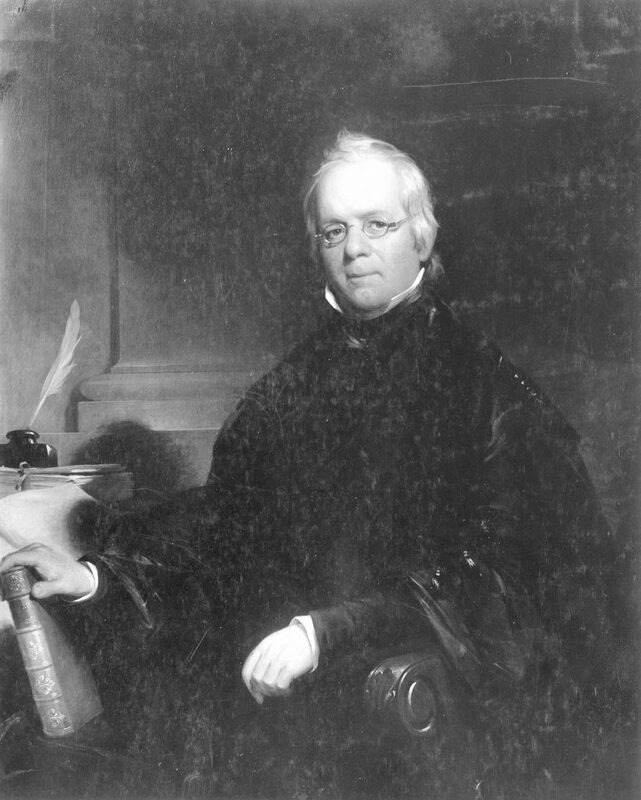 Wylie received an honorary Doctor of Divinity degree from the University of Pennsylvania; in 1828, he joined the University of Pennsylvania faculty as a professor of the humanities, teaching the Hebrew, Greek, and Latin languages. In 1834 he was also appointed vice provost of the University. He ably filled both positions until his resignation in 1845. Wylie was the author of The Faithful Ministry of Magistracy and Ministry upon a Scriptural Basis (Philadelphia, 1804), Life of Alexander McLeod (1855), and a Greek grammar (1838). He was elected a member of the American Philosophical Society on January 17, 1806, and received the honorary degree of Doctor of Divinity from Dickinson College in 1816. Few men have ranked higher than Dr. Wylie in classical literature and theological attainments as a teacher, a pastor, or a Christian. Wylie married Margaret, daughter of Andrew Watson of Pittsburgh, originally from Scotland. Their son, Theophilus Adam Wylie, born 1810, graduated from the University of Pennsylvania in 1830, and served as as academic assistant at Penn before going on to teach science and mathematics at universities in Ohio and Indiana. In 1837 he settled at Indiana College (now University) in Bloomington where his cousin Andrew Wylie was professor and the first president. Another of Samuel Brown Wylie’s sons, Theodore William John Wylie, was born in 1818; he graduated from the University of Pennsylvania in 1836, studied theology, was ordained, like his father, to the ministry of the Reformed Presbyterian church, becoming associate pastor at his father’s church in 1838 and then full pastor after his father’s death on October 13, 1852.